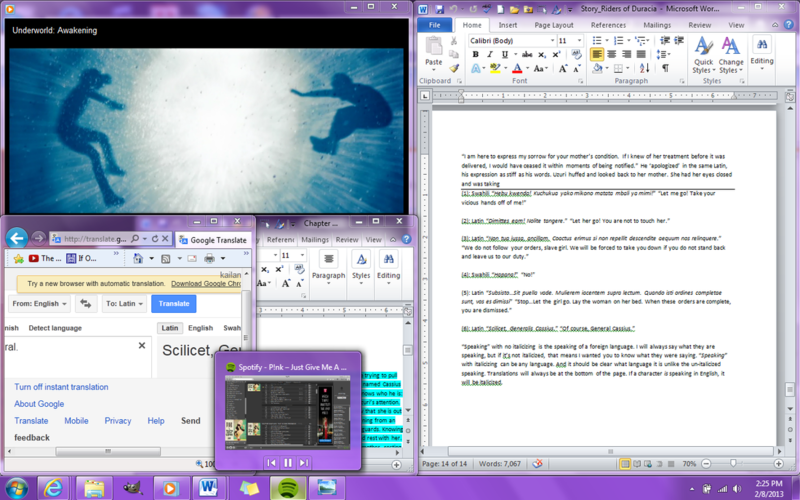 A look into the writing process of Jolly Writer 2.0. 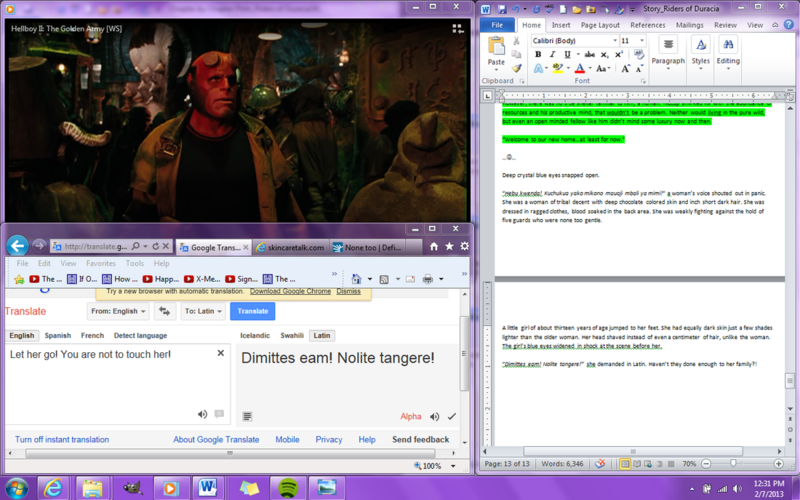 I'm watching Hellboy 2: The Golden Army, while writing chapter 5, and also using Google Translate because I'm none too multilingual. I tend to do this often. I was watching Legally Blonde 2 as I wrote part of the first half of chapter 4, then I watched Hellboy to finish writing chapter 4. Now I'm watching Hellboy 2 for the first half of chapter 5. I'll probably pull out Underworld: Awakening for the second half of chapter 5. I would watch How to Train Your Dragon since that would make sense, but it's stuck in my TV. I have a small TV with attached DVD player in my dorm room. But I lost the remote. And without the remote, I can't play it or eject it. So that's out of the question. 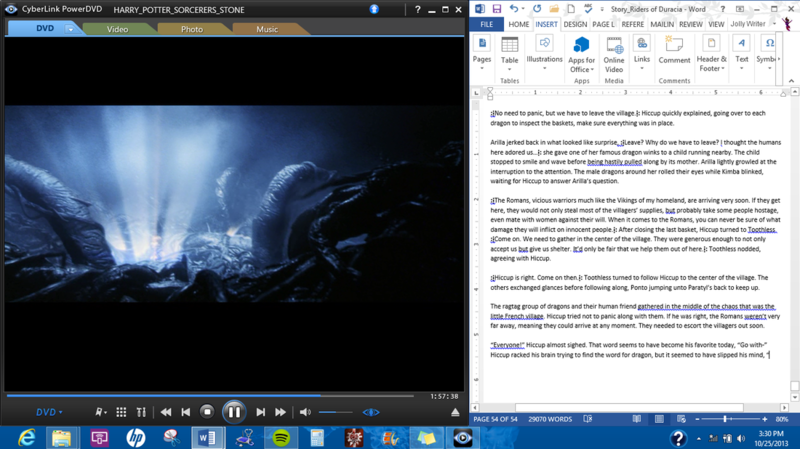 And now there's the second half of chapter 5 with Underworld Awakening, G Translate, and my chapter by chapter plot document. Oh and I paused the movie to listen to P!nk's "Just Give Me A Reason" ft. Nate Ruess. In the last picture, that's my normal way of writing this story. 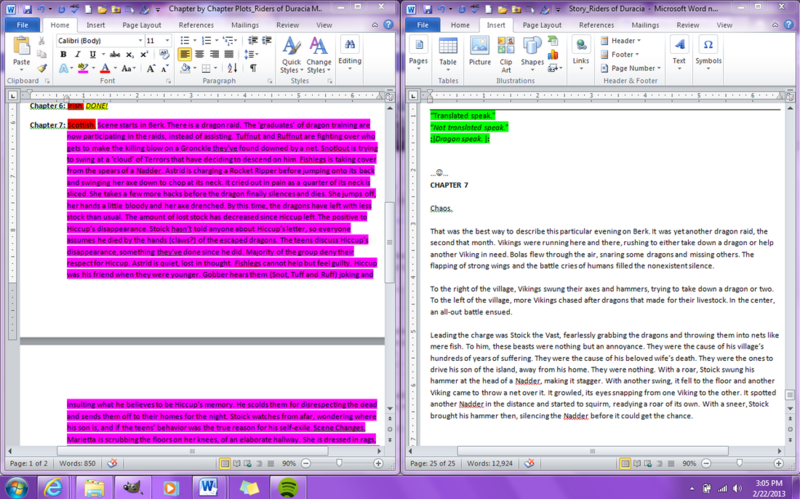 Chapter by Chapter Plots on the left, the actual story on the right. I like thinking of what the chapter should be about before I start writing, because then it would just end up being a ton of nonsense, or will have no direction. 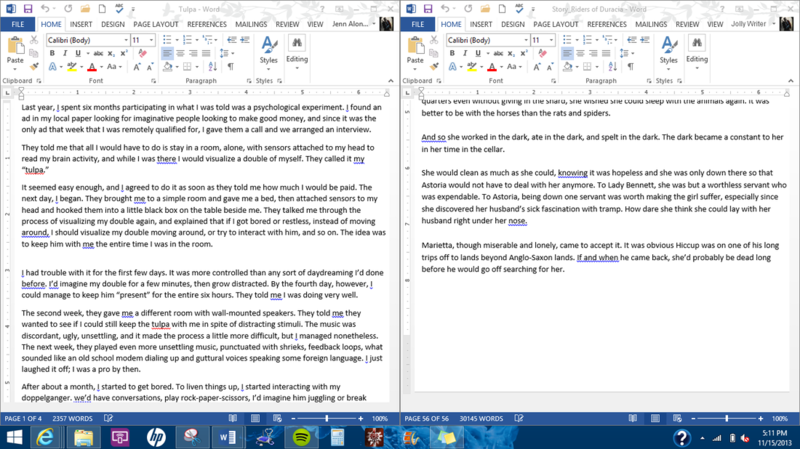 All my chapters starting from chapter 5 will be separated into two different sides of the story. This isn't just a story about Hiccup and Toothless, they're just really big characters. But the story is called "Riders..." for a reason. If it was just about Hiccup, it would have been "Rider of Duracia". Yay, I'm writing! I guess I got just the push I was looking for. I was in need of motivation and I got it on October 25th, 6 days before my deadline. Let's just say that my new laptop sometimes rejects the campus wifi, so while on campus waiting for my class, I was stuck for 5 hours without any wifi. I commute but I also get dropped off, and Friday is the day I have one class at 5:30, but due to personal situations and the like, I get there by 12:30. But I thankfully packed my Harry Potter movie-pack and started off with number one. That to the right of the movie is Chapter 10. So I found this little story on Tumblr, and now I decided to add extra to chapter 11 because of it. I already knew what I wanted to happen, but this little story not only makes chapter 11 longer, I get to work with some new material that could be a backstory of sorts later on. So if you want to know the story, just ask and I'll post it. 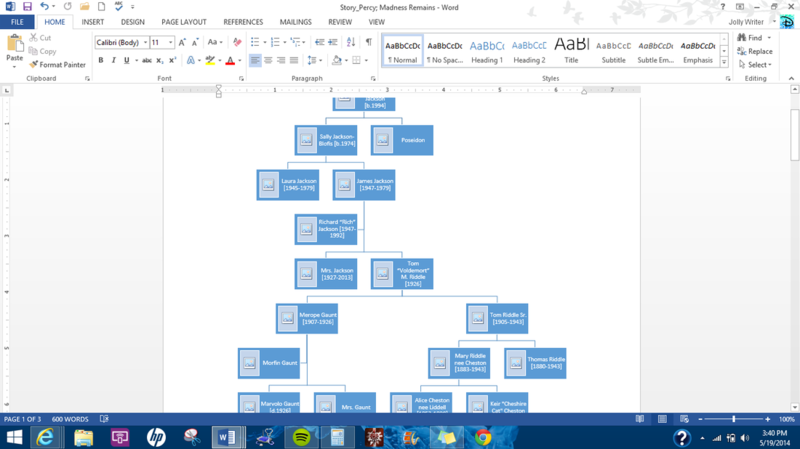 Coming up with the family tree for this twisted line was actually fun. I came up with it before starting the story of course, since I had to make sure all the DOBs fit with each other, and it works out perfectly. Thank you conveniently compatible DOBs of characters from different series that have nothing to do with each other!